The Irish government began minting the original 10p coin two years prior to Decimal Day, 15 February 1971, hence the first 10p coins were dated 1969 and 1971 – when they were first circulated. These coins retained the exact design and dimensions (except denomination) of the old (pre-decimal) florin coin, first introduced to the Irish Free State in 1928 and the two coins circulated alongside one another until 1994 – when a new, smaller version was introduced. Following the successful introduction of the new 20p coin in 1986 and the new, smaller version of the 5p in 1992, it was proposed that a new, smaller version of the 10p would be also introduced into circulation … circulating in 1993. No ten pence (10p) coins had been minted since 1986 and there was by now a definite need to circulate 10p coins but the monetary value of the coin necessitated a smaller ‘cheaper to produce’ coin. Similar to the situation in 1986 when they introduced a new 20p coin, all vending machines In Ireland needed to be re-calibrated in advance of the circulation of the new (smaller) 10p coins and, with so many public phone boxes scattered around the country, Telecom Éireann engineers were issued with sample coins to test their equipment with. How rare are they and what grades do they turn up in? how many Telecom Éireann engineers were there in each county? how many of these engineers were involved in re-calibration of phone boxes? were some engineers working in more than one county? how many coins would each engineer need to do his/her job? 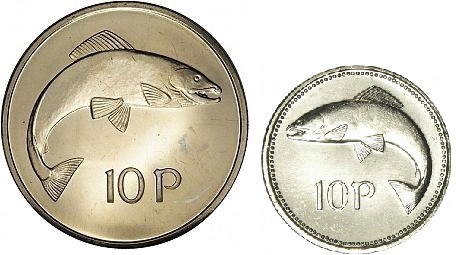 Large ten pence coin (1969-1986) and small ten pence coin (1993-2000) – note, the fish (salmon) is reversed in the later coins. In 1986 the Central Bank of Ireland produced a specimen set of normally struck uncirculated coins (often incorrectly referred to as proofs) to coincide with the introduction of the new 20 pence coin. Several of the denominations were not required for normal circulation purposes, therefore small quantities of the halfpenny, the 10 pence and the 50 pence were minted to facilitate the production of these sets. Consequently, these denominations and the BU sets containing them are scarce. Many of the 1986 sets were sold into the Irish tourist industry for re-sale to visitors looking for souvenirs before the local collecting community was aware of their existence. For this reason, many of these sets turn up in the USA, Canada and Europe and, for monetary gain, some sets are broken up to sell the three scarce coins individually – at a higher profit. There is nothing illegal about this and it only makes the original sets scarcer and, possibly, more valuable. The original glue that binds the presentation packs often leaks and ruins the packaging – the packs in poor condition are usually good candidates for breaking up sets. The original five pence was last minted in 1990 and in 1992 a replacement was 3.25 grams in weight with a 1.85 centimetres diameter (differing from the corresponding new British five pence coin). This new coin kept the old design but incorporated some changes, notably the location of the figure and reversing the main design of the bull. The composition of the five pence was 75% copper and 25% nickel. Large (1971-1990) five pence coin and small (1992-2000) five pence coin. 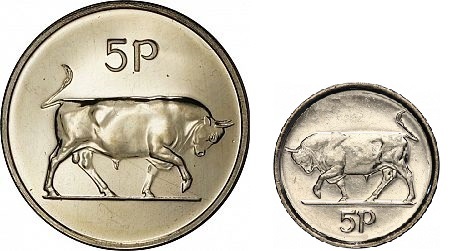 Note, the bull is reversed in the later coins and the denomination (5p) is placed at the bottom. Did the Central Bank of Ireland issue a 1991 5p to Telecom Éireann engineers to calibrate the phone boxes before the introduction of the new (smaller) 5p coin in 1992 ??? If the vending machines had to be calibrated in 1985 and 1992 for the new 20p and smaller 10p, respectively – it is logical that a similar exercise was carried out in 1991 for the imminent arrival of the smaller 5p in 1992 – unless they could complete the project within the first five months of 1992. To date, no 1991 small Irish 5p coins have been found or reported. Check your stash of old Irish coins now ! Do you collect Irish coins? ← O’Brien Rare Coin Review: Why is the 1985 Irish 20p coin so valuable? I have a 1982 5p coin and a1993 10coin are they worth anything. If you go to the Central Bank, you’ll get approx. 20c for them. Just wondering if the 1995 5p Irish coin is worth anything? Have you checked out my Irish Coin Values pages ? I have 2 20p coins 1986 and 2000.I also have 3 10p coins 1993,1994 and 1996. My son found a 1992 Eire with the Celtic harp on front but on the back it has a bull and 10P on the top of the bull. The bull should have been for the 5pence. Any advice and could this be a misprint? Sadly, your coin is a very common coin – tens of millions were produced and many million still survive out there. The “warrior” is an effigy of Britannia “ruling the waves” an this is a symbol from the glory days of the British empire when their navy effectively won and defended their empire + trade routes. The 10p and florin are two different coins. The last florin was dated 1968 and the first 10p was dated 1969. They are both one-tenth of an Irish pound. The 10p (ten decimal pence) and florin (2 shillings) are two different coins. I have a eire 10p from 1995. Is it worth anything? That would depend upon grade, i.e. condition.